Canadian Canoe Routes • View topic - A different type of boat extraction. A different type of boat extraction. Post subject: A different type of boat extraction. So a strange thing happened today at the Credit downriver race. Something that long time paddlers have never encountered before. I am constantly telling people they should take a swift water rescue and this just ended up being another reason. Both Jim Mark and I are long time (over 45 years) paddling and neither of us encountered a situation even close, even though getting a boat out of the river is always different but there are always similarities. I was behind the boat that swam and quickly caught up. The 2 paddlers only swam about 100m but wisely got out of the very cold water. That was a good choice as I was only behind by 25 m at this point. The boat at this point looked like it was floating straight with current. My plan then was just to paddle up, push the one end of the boat down, and then grab the other end and perform a canoe over canoe in the river and clip my towing line on to the empty boat. This is something I have done many times over the years. But when I went to push the one end down, I just about ejected myself out of my own boat there was no give. I paddled to shore emptied my boat of the barrel, made sure my tow line was ready and ferried out to try again, (about 10m for shore)and again no movement when I hit the boat. Jim Mark arrives at this point we know the boat is caught on something, between the two of us we have 4 throw ropes, numerous prussic carabineers and pulleys, so we know we have the equipment. Jim has a drysuit so he volunteers to walk a rope out to the boat and clip on one rope to the boat. We clipped another on to Jim’s “D” ring on the back of his PFD and he used a paddle for stability to get out to the boat. The water at it’s deepest was 2.5 to 3’ deep, but it was a good current. He came back to shore. We both tried to pull the boat and nothing. We then moved upstream for a better angle and even with pulleys, nothing. 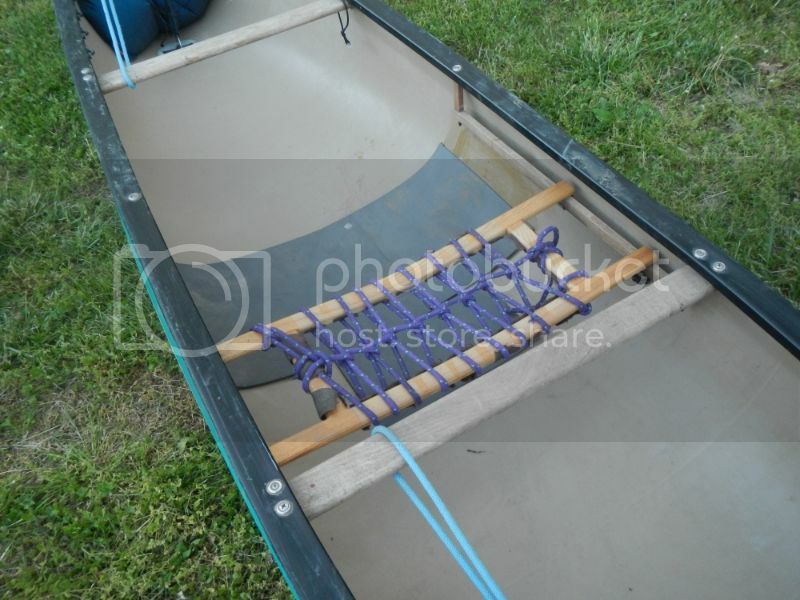 So we re-attached the rope to Jim and he used the rope tied too the canoe for balance, I was on the boat rope, and the other 2 paddlers had Jim, It took some considerable effort for Jim to lift the boat and it started to roll a bit on to Jim’s leg and they pulled Jim back too shore. The boat was still parallel to the current but at least now we knew what we where dealing with. Somehow approx. 100 pounds of grass roots and dirt wrapped around the one thwart that was still attached to the bottom of the river. The other paddlers where starting to shiver so Jim sent them back to their car since we where only about 300m from the car, we knew we could get the boat, it was just a time factor on how much longer it would take us. One word “Weird” You can always say white water keeps you fresh…. If you don’t mind playing in cold water and cold temps and the story has a happy ending. Post subject: Re: A different type of boat extraction. Good story. That is bizarre about the tangled up thwart. I once got my leg tangled up in vegetation while scuba diving in a fast moving water and that was rather unnerving. I guess its like one of those birds nest fishing knots that sometimes happen on your real. In the blink of an eye you have a real mess on your hands. I don't find Jeff's story bizarre at all. In fact a very similar thing happened to my husband last year on the North Fork of the White River in Missouri. He got sideways in a sweeper, jumped onto the tree. The dog self exited.. He was trying to get the canoe over the tree when he lost control of it. It rolled and took off downriver upside down. I knew he was OK and thrashing through woods and went downriver to find the craft and try to bump it to shore or against something solid. The current was persistent but not too much volume. I got it against a rock and then tried to pick up and end to do boat over boat. Won't budge.. Wait for some more paddlers to arrive. Won't budge. Finally several set up a z drag from shore but still someone (hubby) had to wade in and come at it from below. The water was about four feet deep. Wrenched and wrenched and it took five min even with z drag. The reason it took so long is a big totally submerged rootball had entangled with the seat webbing and each effort ripped just a little webbing until enough was ripped to get the canoe free. Great.. now we have four more days of paddling and only a seat frame. You can never have too much rope. When I taught a lot I always told the students to be aware even in the easy stuff because of root balls, because most of the time you can't see them, but they will catch you and usually don't make a lot of surface action because of the slower speed of the current. I figured what happened is when the ice went out it ploughed the grass and roots into a hump and it caught the boat. The Credit hasn't had a major flood since 1974 so there has been a lot of vegetation growing on the flats below the banks. There was another just off to the side of the boat because I hit with my paddle ferrying out to the boat. Just another item to remember for the moving water bag of experiences. The weird part is you start with a mind set of "It's a piece of cake"
Then after a little while you start to say "what the......."
But all the effort did make us very warm on a cold day. Yah my Root Ball was the original Hand of He** with at least one outstretched but underwater invisible finger. Jim Mark arrives at this point we know the boat is caught on something, between the two of us we have 4 throw ropes, numerous prussic carabineers and pulleys, so we know we have the equipment. Jim has a drysuit so he volunteers to walk a rope out to the boat and clip on one rope to the boat.
. Somehow approx. 100 pounds of grass roots and dirt wrapped around the one thwart that was still attached to the bottom of the river. had trouble with the narrowing/faster water at the foot of the bridge. Sounds like you some fun. I've seen a boat upset off a shallow smooth rock, just below the surface, and having both the boat and occupants go completely under water. The depth was about 6 feet (bottom of Palmer) and they resurfaced about 15 feet downstream. The common thing they had with your incident is that the boats had no floatation bags. I suspect that is how the thwart came into contact with the submerged root ball. Last edited by PeAK on April 10th, 2014, 9:13 pm, edited 1 time in total. "Neat" things can happen at the bottom of Palmer rapids depending on the level. At high water I have done moves similar to what you described but still sitting upright in the boat. Lots of fun once you get use to the feeling.